A bright, basic but stylish interior with a choice of long, central wooden bench tables or tables for 2 or 4 nearer the wall, leads up to the counter where four very friendly staff await your order. You pick up a menu, queue up and order, pay and take your slip and sit down until they bring your food to the table. While at the counter, you can look into the busy kitchen where the woks are bubbling away. The menu, to eat in or take away, offers all the usual Asian suspects (I was hoping for Vietnamese which I frequently crave since leaving London, but it’s mostly Thai) and a blackboard shows the specials and meal deals. There were three of us so we got to sample a good selection – Jill ordered veggie Pad Thai which tasted spot on and contained some nice-looking tofu cubes (I didn’t steal any). I went for Tom Yam Goong soup (5.50), hoping to banish my long-weekend fatigue/hangover with a kick of chili, and the special salad which was a selection of fresh veggies with cashew nuts & grilled chicken (6.50). Both were delicious and very authentic, loads of prawns in the soup (always a pet hate having to play ‘Hunt the Prawn’), and an equally plentiful supply of cashews and chicken in the salad. Yum. Our third amigo had Chicken Massaman (10.95), which was as sinfully good a Massaman as I’ve tasted and came with a huge portion of brown rice. We decided to save the boozing for later, so all had soft drinks, but there’s a selection of beers and wine for the less restrained. As an extra source of profit, we reckoned Neon could make a killing by buying up bags of fun-size Flakes to sell at a small cost to greedy punters like us who’d prefer to turn their cone into a good old Irish 99… but until then it’s BYOF* . So, I loved this spot – fresh, tasty, cheap, a bit creative and great for a pre-Whelan’s or pub stop-off or lunch if you’re in the area. Totally suitable for solo dining also. *Bring Your Own Flake, of course. 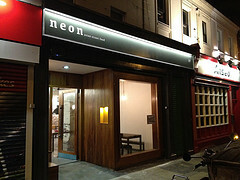 Neon, 17 Camden Street, Dublin 2. I thought it was only right that this should be my first review as it’s probably the restaurant I’ve eaten in most, and recommended most, in the last few months. One of its main attractions is that it’s five minutes from my house, and tucked down the lane beside my local, Slattery’s in Rathmines. The other is that it’s BYO – very popular in Dublin these days, and a very affordable option for a night out with friends. Oh how I love rocking up at Slatt’s, bottle of Ripasso in my handbag, to enjoy a G&T and the knowledge that we’ll soon be filling our bellies with Palestinian delights. Little J is a tiny spot, but oh-so-cosy. You’ll feel like you’ve been transported to a corner of the Middle (or is that Far?) East rather than being spitting distance from the dubious delights of the Swan Centre. All down the left side is the counter where the fresh salads, dressings and bread are prepared – I think they serve their wicked strong coffee here during the day also. The rest of the long, narrow space is filled with small tables, chairs, cushions and an abundance of eastern paraphernalia (I love the ‘Palestine’ jewel boxes that the bill sometimes arrives in) for you to squeeze in between and soak up the atmosphere. First thing to do is get the wine opened and get stuck into ordering some starters – a selection of their starters can be enough of a meal for a group, if you all want to try something different and not be tied to a main course. I’ve tried most of the dips at this stage – the hummus, baba ganoush, and foul mudammas are all super fresh and super tasty (albeit super salty – so get that BYO hydration down your neck) and are heavenly when mopped up with the fresh-baked flatbread that will be delivered to your table in abundance. If you’re familiar with Lebanese, you’ll know the drill – Palestinian food is broadly similar and all the usual dishes are here, with some star main courses worthy of a mention. The “M’Sakhan” and “Makloubet” chicken dishes are fantastic, the former being my favourite, slow-cooked chicken on the bone flavoured with sumac, red onion, lemon, garlic and nutmeg, and accompanied by pomegranate, salad and – you guessed it – freshly baked flatbread. For more simple tastes, the grilled chicken, lamb and/or kofta skewers are always so tasty straight from the grill. Most main courses are in the 10-14 euro price range. The only gripe I had on my last visit was when we ordered a couple of side dishes to go with our main courses, and received tiny portions of green salad and tabbouleh for the princely sum of 5.95 each, which is completely at odds with the pricing of the rest of their menu. So don’t order the side dishes! Now that I’ve said all that, I’ll admit that weirdly enough, it’s not the food itself I’m such a big fan of. Obviously it’s tasty, sociable to eat and something a bit different, but it’s all a bit carb-y for me what with all the bread, pulses, fried things etc. and those who know me will be aware that Mr. Carbohydrate and I are best kept as occasional dining companions. But as an occasional treat, with such a great ambience, the advantage of being able to choose and bring my own wine and the fact that we can emerge in a blissful food-coma for not much more than 20 quid a head, Little Jerusalem wins my custom for all sorts of eating-out occasions. It’s cheap enough for the most cost-conscious of companions (or the weekend before payday), romantic enough for a date, and loud enough to go with your girlfriends and several bottles of wine on a Friday night for a raucous evening’s gossiping. 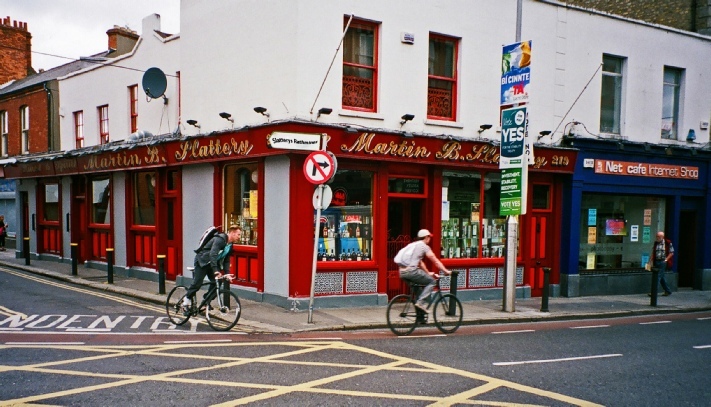 So if you haven’t tried it, go soon – it’s worth the trip to Rathmines if you’re not a local. And if you are, and you haven’t been yet – what are you waiting for? 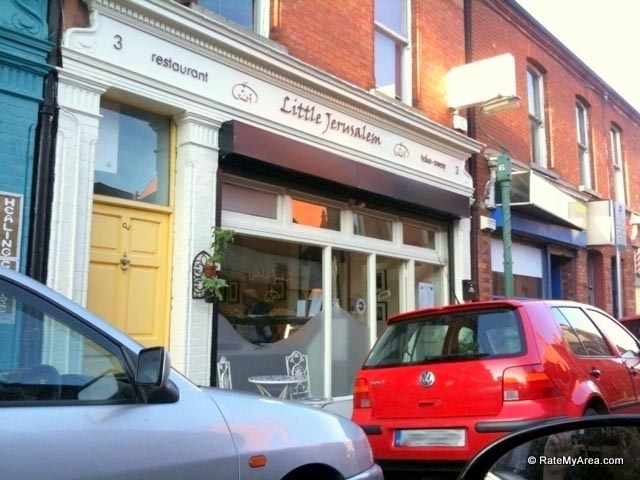 Little Jerusalem, Wynnefield Lane, Rathmines, Dublin 6. Photo credits: ratemyarea.com and Slattery’s Dublin website.